Update: Congrats to Kasey #60! of having college daughter home. complete with squabbles, playing games & very late nights. Been sewing a lot too! "Domestic Bliss is inspired by all of the comforts of home, both indoors and outdoors. Elements of nature, decor and architecture are represented throughout and come together to convey a tone that is both modern and vintage at the same time." It's available here in layer cakes, jelly rolls & charm squares. What goes well with domestic bliss?? Sunny Happy Skies is by Bella Blvd. strips/rolie polies & charm squares. For our giveaway today, your choice of a charm pack from either collection. I got a sewing machine cover. Love it! "Mother!!! Can you tell them not to paint a mustache on me?" I just got some of the Domestic Bliss so the Sunny Skies would such a perk here in cold, bleary NY right now - I'm ready for spring. I got an ipad and I'm in love. I gave a beautiful table runner featuring little snowy houses all in a row. Thanks for the chance! I knitted socks for my brother's daughters + sewed clothes for their build-a-bear. I got the Farmers Wife Quilt book..yay! I totally impressed my husband by finding some war memorabilia from WWI and WWII for him. It sure feels good to gift something that is so surprising and welcome to the recipient! We've had such sunny HOT skies here that sadly may daughter hasn't had much chance yet to use the monkey bars we got her! I didn't get anything! We don't give gifts :(....I did manage to give some things away though. I gave my sister in law a little wallhanging as a thank you for hosting this years Christmas dinner. I also gave all the people on my Christmas card list a little (handmade) snowman! Does that count for anything? I got a wonderful Christmas with my family and they gave me lots of sewing time. 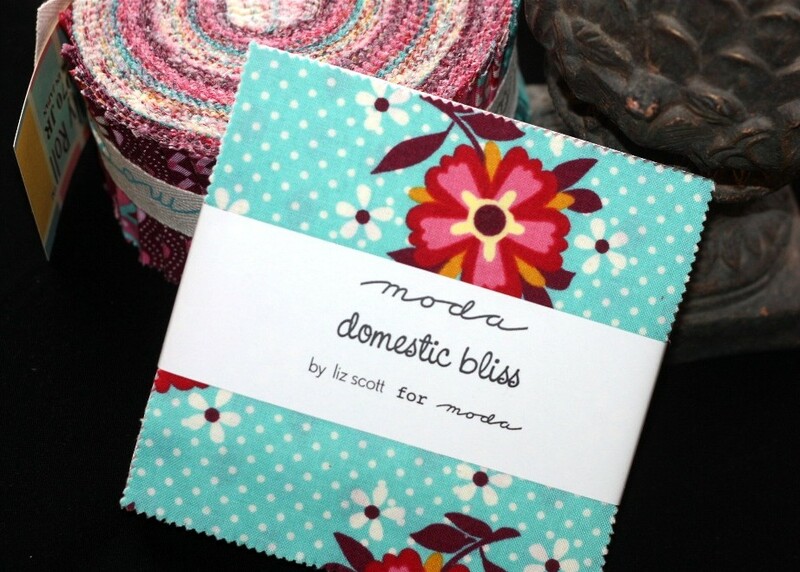 I love the domestic bliss collection. I got a new pair of walking boots!!! Sweet fabric! I gave my brother and his girlfriend a black and white Mountain Majesties quilt for Christmas. They loved it! I got a sort of a snow ball but its not round and the little light would light up when I shake it. I love it! i love Sunny Happy Skies. I received a gift certificate for my LQS. I made some children quilts. I got a new granddaughter for Christmas, well actually about a month earlier but I also got to spend about three weeks with my daughter and her little boy and new baby girl. Wonderful!!! Oh, they're both so pretty!!! I think I would chose the Sunny Happy Skies...but it's hard to decide. I received an extension table for my sewing machine and it's just lovely. I've been using it since the new year! Thanks for a chance to win! Happy New Year! I got a new chair for my sewing room. More cushion for longer sewing sessions! Thank you for offering them. I like the Sunny Happy Skies! I made scalloped tote bags for my sisters and nieces. I think they turned out so cute! My son gave me a great lime green camera case. So cool! Got a few new quilt books too. Hope to use them soon. I gave a quilt to my soldier son home for Christmas. It was made with tons of love and his striped shirts. He loves it and took it back to Fort Hood with him to keep him warm. Soldiers need quilts too. Happy fabrics for a January. I got a new cutting mat over the holidays- it is wonderful. I didn't realize the difference it could make! I could use some sunny happy skies! I got a new sewing machine! Yea me! I got a Half Moon Modern layer cake, from myself! ;) Domestic Bliss makes me anxious for summer! I need that domestic bliss too! Three college /grad students home for the holidays! thanks and I gave a table runner to my mother in law. i got a new sewing machine for Christmas! It is a janome Horizen. Love it! I received a GO! love it! Really tough to choose just one! But I'd take Domestic Bliss if I am so lucky to be chosen. I asked Santa for a Bean N Read and he brought me one. Love, love, love it! My mom made me a pair of flannel slippers for Christmas. They are very cozy! I made fudge and in return got caramel pecan rolls, very yummy thanks to my sister-in-law and brother. Thanks for the chance. These are two great collections. I am feeling very Sunny, Happy Skies today. I gave someone a velveteen cap and scarf set. I got new work out clothes. I was really happy in both the giving and the receiving. Ooooooh pretty! I got a bunch of sewing notions, and a cute little box to put them in. I'm a total notions junkie. I made my little nephew a rag quilt for Christmas. I don't think he was too thrilled (3 year old), but his mom loved it! I got a Kindle...I love it!! Got a JoAnn's Gift card to buy some "notions"
I loves the Domestic bliss if I'm the winner. Thx!! My gift for Christmas was that all 3 of my children were home for it and the best part... they did the dishes after Christmas dinner! Woot! Woot! Now if I could only get them to cook it too. I got a 3 crock- crock pot. I love it!! I received a charm pack of California Girl and that generated a smile from me. Happy New Year to Quilt Taffy! I received a piano for Christmas. Haven't taken lessons since high school, but thought it would be fun to play again. I love the Domestic Bliss! I received a new tempur-pedic pillow! It's yet to arrive at the store so I hope this means I'll get some great sleep once I get it! I got an IPad for Christmas. Hubby and I usually purchase our own gifts so I was blown away when he came home with this surprise. We didn't go big time into the gifts this years, but our family did get the chicken pox (and a Wii). 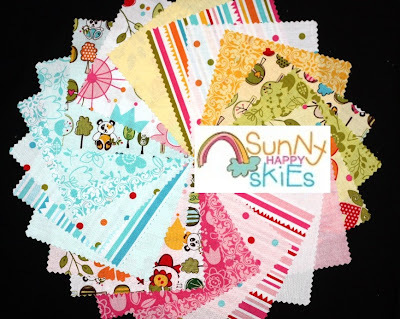 Such cute fabrics - I love the uSnny Happy Skies! Happy New Year!!!! I received some wonderful gifts. Perhaps my favorite is the Quilt Album software to use in documenting my quilt projects. Thanks for another giveaway! The colors in Domestic Bliss are perfect! This year I made ruffled scarves for all the women in my doctor's office. They worked up quickly and were fun to make. I "gave" my husband a quilt I had started a couple of years ago and finally finished. He thought I had forgotten about it! I made some fun "Day of the Dead" toile pillows for my son and his wife, a ripple afghan for my other son, and some crochet washcloths for my daughter. My wonderful DH bought me one of those wooden rocking chairs from Craker Barrel for the back patio. Good thing I live in FL so I'm able to use it now. i loved giving our kids the xbox kinect and a trampoline. i was happy with the trampoline (wear out my children so they're exhausted right at bedtime) and my husband was excited to play the kinect with the kids. :-) I'd love some domestic bliss, literally and figuratively. Thanks! I gave my quilting buddy a quilt kit with a kitty in it and a quilt calendar. I love pandas and Sunny Happy Skies. Oooh, I love the Sunny Happy Skies! It would make an awesome baby quilt. I received a kindle for Christmas. I've been wanting one for two years or more. I was thrilled! I received six patterns from the American Album blocks from Shabby Fabrics. I can't wait to get started on them. Thanks for the opportunity to enter your great giveaway. I just love the Sunny Happy Skies line. Yummy fabric!!! My family knows me too well, I ended up receiving two copies of Steve Jobs biography! They know I love biographies but two...hilarious! Oh, the Sunny Happy Skies would be great! I'm collecting charms for coordinating twin quilts for my girls, and those colors fit right in! I received "quiet" time for Christmas. I took a couple of extra days off over the holidays and did lots of sewing and quilting. I also spent time with family. I love the Sunny Happy Skies! What pretty fabric! I recieved the most amazing Christmas parcel from France and the best part of it all is the friendship that we share. Thanks for a chance. I got (bought it myself but haven't received it yet) a new sewing cabinet for my sewing machine. I can't wait for it to be delivered! 3 to 6 weeks of waiting on my part though. GRRR! I got a new table for my sewing room !!!! I got new Ott lights for my sewing area - they are amazing! how did I ever see before them? thanks for the chance! I gave hand sewn gifts to my DD, DIL and all three of the grandchildren! Both are such great fabrics!! Over the holidays I got a Kindle and I'm such a reading junkie now... even more than before which I didn't think was possible. Yea! I'm spoiled. I bought myself (from my kids of course) a Accuquilt Go! Baby and the EQ7 software. I was also suprised by a new iron. I love them both, but would probably choose the Domestic Bliss. Thanks for sharing! I got EQ7 this year for Christmas, and once I get my health under control I really hope to get to learn how to work EQ7 well. I wish there was a blog dedicated to tutorials on working with steps to teach this for free.. that would be so lovely. I love them both, but I think I like Domestic Bliss best. We were thankful to have all home during the holidays. That is more important to me than the gifts. I did make some fun mug rugs and was proud to give them as gifts. I love Domestic Bliss - so pretty! Funy enough, my favorite gifs right not is a sock needle holder! Who knew I would be so happy not to have to worry about sock needle laying around?! Thanks for the giveaway! I got an apple i phone yeah. And I made back packs for my girls for christmas. My two year old calls it ack acks. It is funny she leaves off the first sound of words. I made bathrobes for the grandkids that requested them. The 2 year old absolutely made my day. She loved hers. Wouldn't take it off, she looked like she was in heaven and kept giving everyone hugs. It was so much fun. Love the fabric. Thanks. Love the fabrics! I received a small Christmas plate from my 9 yr old granddaughter, she had bought it at school with her very own money. She has 4 sister's and a brother, I think it was the sweetest gift I could have received, it means very much! I got the Scrap Republic book. Super ideas, I've already sorted out all my fabric, made a block in the "Freckles" style and got fabric organised to make two of the quilts fetid in the book! I got a sewing store gift card and a gift card for some boots! thank you for the chance! have a great day! Domestic Bliss has indeed a gorgeous color pallet. Thanks for the give away. I received new pink/camo cowboy boots from my dad. I'm super excited as I've about worn my others out and I know these will be put to use a lot. This is my dad's first Christmas buying us kids gifts, so it's even more special. I gave rice bags and recieved Hull dishes that were my Moms and Grandmas. My favorite gift - a donation in my name to Best Friends Animal Society!!! If I were lucky enough to win, I would pick Domestic Bliss - I see a very cute Chinese Coins lap quilt with those colorful little squares! P.S. - Thank you so much for the always-generous Giveaways! I love The Sunny Skies- so vibrant and fun. I made four rag quilts for Christmas- so adorable and cozy. My Santa hubby was good to me...I got a Beam n Read! I asked for and received a Rowenta Iron I had been wanting for some time now. What a great iron! I love the Domestic Bliss line. Thank you!! Lol I have domestic bliss every day since we are childless. I got a Keurig! would love to have domestic bliss charm pack if I win though gorgeous colors! I made aprons that were a hit with the granddaughters. Domestic Bliss is a beautiful line of fabrics. I made my daughter alphabet bean bags. The best gift was getting my cast off so I could sew again!!!! Any day spent sewing is a gift. Domestic bliss is a wonderful thing! But I also love sunny happy skies! Put them both together and it just seems like it would be heavenly! In real life or in fabric! My darling husband got me 3 new bathroom faucets and installed them! He thinks it is so funny that I love that gift, but I really do. I practically giggle every time I use one of the new faucets! And I gave my sister a very cozy flannel backed quilt that I made for her. Her kids are all fighting over who gets it when she dies. That's how you know it was a good gift! These colors and patterns are so fun! I made each of my 4 nieces and my only nephew a quilted pillow perfect for a comfy sitting place to watch TV or play games or to curl up on and take a nap. They loved them, which makes me a happy auntie! I could sure use some FOCUS! Is there a fabric line called FOCUS...cause I would buy a ton! I got an air popcorn popper, yeah bring on the low calorie snacks. My 7 year old daughter went back to school yesterday, yeah! My two college girls are home, too. They start leaving tomorrow. I am not looking forward to that! They both received mostly money...one got a new snowboard. I think both collections are gorgeous - thanks for the chance to win one of them, and Happy New Year to you. Thanks for the chance. I gave away for Christmas Iron Cozys/Covers that took me, a newbie, waaaaaay longer than the hour suggested. They looked pretty good though. Both collections look delightful. Thanks agin and Happy New Year! Domestic Bliss since it goes with the red Kitchenaid mixer I got. I gave a fabric basket, pincushion and matching coaster set I made to my quilting buddy. She especially loved the basket so much that she made some to give as gifts to her granddaughters! Thanks for the chance to win one of those adorable charm packs!!! I got an iPod touch . . . too much fun. So not much sewing has been going on around here. Thanks for the chance! Love the Domestic Bliss. I too got a cute sewing machine cover. I gave each of my granddaughters and my daughter hand crocheted gauntlets. One GD loves them so much she asked for a wardrobe of them for her birthday in January. I RECEIVED 'CABBAGE+ROSES' FABRICS>BEAUTIFUL! I'M STILL FONDLING IT>BUT WILL CHOOSE A PROJECT SOON! REALLY LIKE 'SUNNY HAPPY SKIES'! I got to spend Christmas with my entire family this year and it was wonderful! Thanks for the great giveaway. I like the Sunny Happy Skies. I gave my kids and grandkids notebooks with their family tree inside. Lots of reports of kinship and begats. Great fun and they loved them! my daughter got a sewing machine! yeah!! and at 6, i need all the charm packs i can get...no rotary cutter for her! and thanks corrie for the doll directions...you were right...rectangle directions in the material section...my daughter and i might give a doll a try !! I got a sewing machine from my mom! I made some handcrafted things like a tablerunner and pincushions :) I love the Domestic Bliss patterns and colors. I got a really cool set of crochet hooks from my boys! I needed them, but I <3 them too! I made my mom some fabulous placemats with fabric ordered from your shop! I got an early present - some batiks fat quarters. 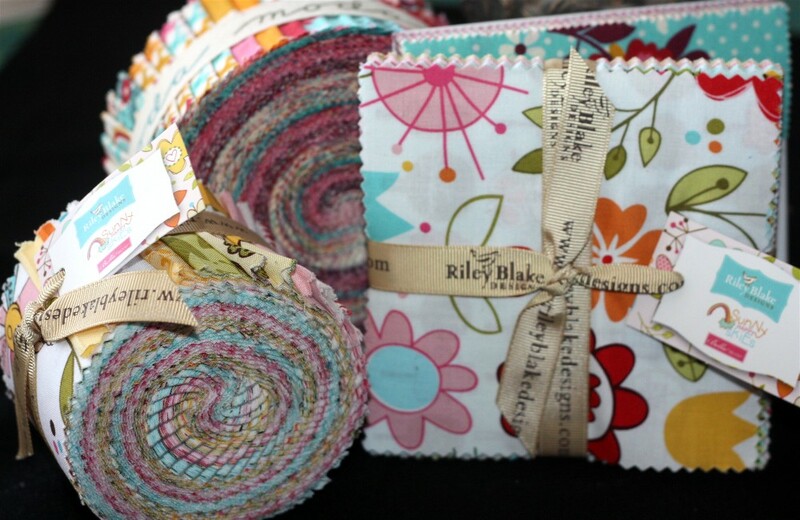 I have already made a few baby quilts but last night I opened up the Raspberry bundle from Fat Quarter Shop. They are so delicious yummy that I will be drooling on this quilt. I got new slippers to keep my toes toasty in my craft room. I got five books for Christmas and I'm on the third one now. As you might notice, I love to read. And quilt, that goes without saying. Gorgeous fabric for your giveaway today. Thanks so much for sharing. 2 books I got for Christmas from America. Now big task for me to translate into Hungarian. It is very fun because I speak very little English. It's good to have pictures as well. i gave my brother a christmas quilt, cuz he kept complaining that i haven't made him one yet. I gave a set of Russian nesting dolls. I got a stick blender, which is really cool! I am super stoked about my gift from the hubs. He ordered a Sew Steady table for my sewing machine. It should be here any day now and I m read to rock and roll! I do mostly large quilts and my main issue is the massive weight pulling on my needle as I free-motion. This baby will remedy that! I got the pleasure of seeing both my girls open handmade presents from me and loving their gifts..I gave one a jewellery roll and the other a pouch with one side in clear plastic to keep her figurines. I was given a Dyson DC35 handheld. Now I know as a woman I am not supposed to like practical presents. This one however is great as it is small enough for daughters to handle and they have been vacuuming for me since it arrived. I got a new IPhone 4S. Still hasn't shipped yet though! I got an engagement ring. I gave 100% homemade gifts this year. I got the best present of all, a healthy happy new grandson! I gave each family member a memory quilt. There were many tears but happy smiles as well as they know their quilts hold a whole lot of love. Thank you for a wonderful giveaway. They are both beautiful designs. They are so beautiful, both of them!. I got plenty of time off to spend with my children, priceless! Thank you for the chance! My husband gave me a bracelet with my daughters' birthstones. The fabric is beautiful either would be wonderful to have. My favorite gift this year was a Kindle. LOL, having the kiddo's home is both fun and energy draining at the same time~ enjoy the chaos, the house will quiet down again soon. My best gift was having our two college kids home and movie nights. :-) I really like Happy Sunny Skies. Thanks for the chance! 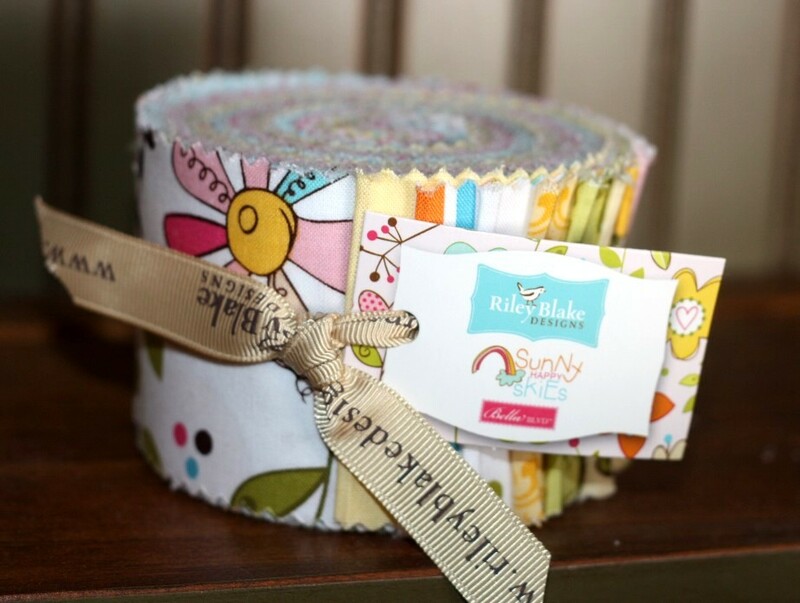 Thanks for a chance to win some yummy fabric. It's been months since I saw my sewing supplies (they're all packed because we moved recently) and I'm craving for a crafty afternoon!! I got 'Dare to be Square Quilting' by Boo Davis - fantastic! I gave a couple of quilts to charity! Thanks for the chance! sunny happy skies is delightful and would make up something nice with the aqua jelly roll i got for christmas! i made and gae mugrugs to my quilting friends. I love Domestic Bliss, super pretty! I got an embroidery machine for Christmas from my wonderful hubby, I love it!! I got myself EQ7 (Electric Quilt 7) for Christmas! Thank you for a chance to win. I received something so so awesome! I'll tell you about it when I see you! Thanks Corrie. I-pad. Thanks for the giveaway. My husband got me an electric blanket...doesn't sound very exciting and is boringly practical but it's what I wanted. He's gone for the next 3 months and I hate getting into a cold bed at night. I love the colors in Domestic Bliss! Oh, Domestic Bliss, for sure! Kind of goes with what I got--the pleasure and honor of finally being able to host the family to Christmas dinner in my home. It was wonderful to have everyone in my home. I have a near-Christmas birthday, and for it, my husband put together shelving units so I could organize my craft room!! I received a vintage Singer 301 sewing machine with it's cabinet! It won't be my main sewing machine but it's going to be tons of fun to piece with! I love the Domestic Bliss! I received a beautiful engraved bookmark from my best friend Victoria and I gave a quilt to one of the nicest ladies at JoAnn Fabrics who always cuts my fabrics and always remembers what is going on with me. I gave my dad a nice wood cutting board with lots of grids on it, so that he can slice and dice everything to perfect and coordinating size. He's a little OCD so he loves that cutting board! Everyone talks about the empty nest when the kids leave for college but no one warns you how difficult it is when they return for the first winter break. I have my fingers crossed that things will go smoother over summer break. So I could use some Domestic Bliss too. Or a repeat of my Christmas Gift..2 days in Chincoteague Va. alone with the hubs. My hubs and I did a joint gift of replacing our camera this year. So glad we did. The best give was giving my daughter fabric and seeing the smile as she selected what she wanted to work with. I got a cookbook. I love it. Sunny Happy Skies looks like fun!!! For Christmas I got a lap top.... woo hoo!! I just finished 6 notebook covers and a sewing room work apron for gifts this past week. After Christmas get together with friends gifts to give. 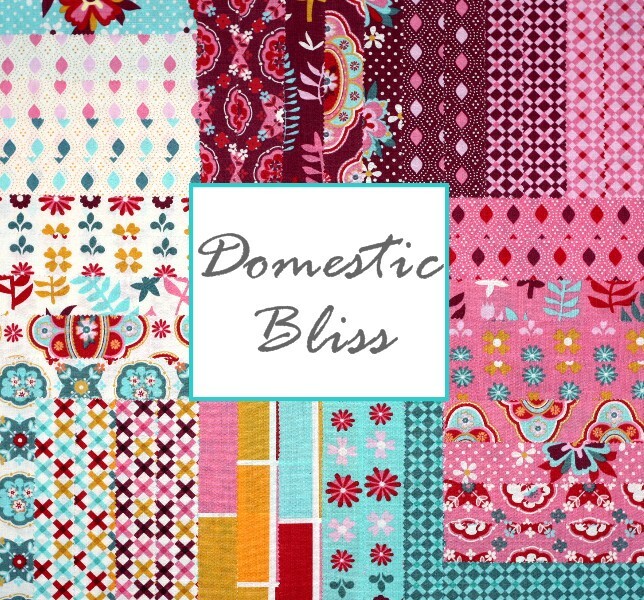 Domestic Bliss would be my charms choice for all the colors. For Christmas I didn't receive anything quilty. My favorite gift is new PJs - it dropped down to a low of 18 degrees so used them right away. Welcome to my Florida. Most years recently we haven't received gifts from each other, but this year husby gave me a Cuisenart food processor and stick blender...I haven't used either one yet, but I am hoping to real soon. Our Christmas was pretty low key this year. Our big gift was two adorable twin boys. They are both beautiful prints and would make such happy quilts, into happy, in the winter, lol. For Christmas I got an ipad, no idea why, but it will be nice when we go on trips. I gave out a few presents as surprises this year, to online friends as a thank you for their kindness, that was my favorite thing to do for the holidays. Love both packs....too cute. Something I gave....I gave my mother a quilt for Christmas and was able to keep it a surprise. Ohhh, I got so many wonderful gifts but the one that made me cry was the card my son gave me stating that he had given to World Vision in my name so that a woman in Africa will have a sewing machine! Domestic Bliss is my fav but I like them both. My husband surprised me with a little point and shoot camera that works wonderfully! So nice to be able to take one picture and have it turn out. I gave a New Wave quilt to my sister, and got some beautiful jewellery from my hubby and sister-in-law. I received a book from a dear friend, titled "1: How Many People Does It Take to Make a Difference?". Enclosed was a lovely note about how I have made a difference in her life. That was very touching and special, especially from her. I gave several goody-filled drawstring bags, which I had a blast making ... all 20 of them. I got a plaque that read "keep calm and have a glass of wine". My kids know me so well! I love my gift: a gift certificate to have my car waxed and detailed. Difficult choice, but I really like the Bliss line. Thank you for the giveaway. I got a new extra large topper for my ironing board- love it! 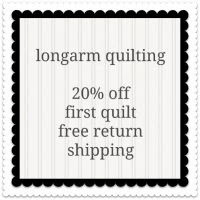 Perfect for quilters! Thanks for the giveaway. I received gift cards to my favorite quilt store. I really like the Domestic Bliss fabrics. My husband and I got tickets to see Lady A in concert later this month from our daughter and husband. Very excited to see them. I can almost hear the birds chirping with the Domestic Bliss and Sunny Skys... or was that Days? I had a great gift given to me. I docking station for my iPod. I love music and my CD player in my sewing room broke, so now it's back to a happy little place! Happy New Year to you! What joy you must be having!! My girls are 5 and 7 and I got plenty of headaches trying to break apart their squabbles .... I'm praying this new year will bring a bit more piece!! I gave four table runners made in the last two weeks of December for Christmas :) Thank you!! Thank you for your nice give a way. I got a GC to a favorite fabric shop...AWESOME!!! happy new year and thanks for giveaway. I've got my son home - it is nice to have him back in the house. best present i got was a new camera! My daughter gave me a new toaster! All fresh and new. I got a Kindle Touch from DH. Yay!!! I am loving the Sunny Happy Skies. I finally gave my husband a quilt for Christmas. He asked for one several years ago but I wanted it to be something special and it took about 2 years to collect all the fabrics for a memory quilt. He does love it and I loved making it! This is more about my hubby than me. He made out like a bandit this Christmas. My Dad, who has always wanted a son, but got two daughters, got my hubby a pistol. My dad has always wanted to be able to give a son a gun, and my hubby was the first man married into the family, so he was the son my dad never got to have. The look on my husband's face was priceless. If you have ever seen A Christmas Story, he looked like the little boy that got the Red Rider BB Gun. I got the complete line of Hope Valley. Thanks for the giveaway. I gave lots of handmade crafts....a quilted Teddy Bear, pillow cases, a quilt, embroidered tea towels. I tried to give everyone something made with luv in every stitch or something from my kitchen. There is something about a handmade gift that makes my heart sing. Thanks for the chance to win. Mom and Dad got me almost everything on my LQS wish list! I made pot holders, place mats, wall hangings, stockings for my friends and family this year. They are always so thrilled to see what my projects are, or what I have made for them. I do love this collection! Well, for Christmas my DH and I "got" to take a Christmas trip to Nashville, TN! We spent Christmas Eve with the Rockettes. It was wonderful. We crammed a lot into 3 days. We'd always wanted to go somewhere at Christmas, and our family Christmas was on the 18th so this was the perfect year! I made and gave 2 gifts - place mats for my Aunt and Uncle, and a cell phone holder for my DD. I would find it VERY hard to choose between these 2. Love them both!